How I wrote "Buying Lenin"
When "Buying Lenin" was chosen for inclusion in the 2008 Best American I was asked to provide a brief description of how the story came into existence. If you look at the end of the anthology you will notice that, as usual, the more established the writer, the longer their bio, the shorter their description of how the story was written. My description is absurdly long, but it seems that readers enjoy it, so I decided to post it below. 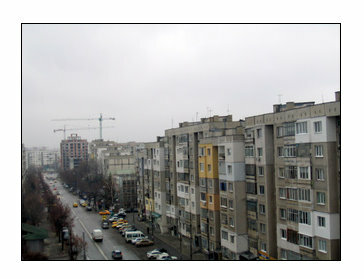 I took the pictures from the main balcony of our apartment in the neighborhood of Liulin, Sofia, on a cold, gray day in December. The apartment complexes are old and ugly, but everything looks much better in the summer when the grass and the trees are green, and the Vitosha mountain is not covered in mist. Factually this story is not biographical. Like the narrator, I arrived in America after finishing high school, but all similarities end there. My grandfathers were in fact hurt by the communist regime, and let's face it – the narrator losing his parents is just a cheap writer's trick. All emotions, though, I drew from my own life. I spent the summer of 2005 back home, in Bulgaria. 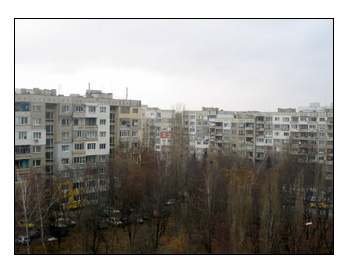 My parents have an apartment in the outskirts of Sofia, in one of those neighborhoods you might see in movies like "Moscow Doesn't Believe in Tears" or documentaries about the ghost towns around Chernobyl. I was walking down the street, looking at the long, tall, gray apartment buildings, and they seemed awfully ugly to me. I knew that one of my grandfathers had spent a portion of his life building just such buildings and it occurred to me that he must have looked upon them with different eyes. Surely he had seen promise and beauty in the creations of his own hands. I wrote a version of the story in two days and thought – that was that. I had not bothered to fulfill my initial idea, and now this was the story of an old communist fanatic, whom I, as a writer, had failed to take seriously. I had left him a character in a twelve page story. I presented the story in my first MFA workshop, and most of my friends liked it fine. At the back of her copy Ellen Gilchrist, who then led the workshop, had written only "send it out for publication." Instead, I expanded the story, put much more of the grandson in and thought – that was that. My workshop hated the new version. They said the grandfather had lost much of his charm and eccentricity. I rewrote again. I was, as Americans might say, frustrated. I printed all scenes on separate pages and spread the pages across the floor, and rearranged, and rearranged, and in the end felt like a fool. I let a month go by, then sat down and wrote two more scenes. Hunting for crawfish, which I knew my great-grandfather had loved to do, and the final letter. It is a preachy letter, sentimental, as workshop folk might say. But as I wrote it, I wept. I was the grandson, away, facing death, alone. It is an awful thing to weep along with the characters you write. It is a terrifying blessing. I thank my friends for their advice, Bret Lott for publishing the story and Donna Perreault for her thoughtful edits. I thank the editors of this series for choosing my work. I thank you for reading it. 681 Khan Asparuh establishes the First Bulgarian Empire. 811 Khan Krum slays Emperor Nicephorus I in battle and, according to the legend, turns his skull into a drinking cup. 864 Boris I converts Bulgaria to Christianity. 886 Boris I offers refuge to the disciples of the saint brothers Cyril and Methodius. Two of these disciples - Clement of Ohrid and Naum of Preslav, both of noble Bulgarian origin, perfect the Glagolic alphabet originally created by Cyril and Methodius. They name the new alphabet Cyrillic, in honor of their teacher. Bulgaria adopts this new alphabet as official. 913 Simeon I The Great assumes the title Tsar, thus becoming the first tsar in history (the first Russian tsar won't be born for a few more centuries). 20 August 917 Tsar Simeon I defeats the Byzantine emperor in the battle of Acheloos, one of the largest in medieval European history. Bulgaria reaches its largest territory, spreading over land between the Aegean, the Adriatic and the Black Sea. 927- 968 The Bogomil heresy spreads through Bulgaria during the rule of Tsar Peter I. Centuries later the Bogomil heretics reach Italy and France, where people dub them Bougres (Bulgres). The word passes into English as bugger. July 29, 1014 Tsar Samuil loses the Battle of Kleidion (Klyuch). The Byzantine Emperor Basil II divides the 14,000 Bulgarian soldiers into groups of 100, blinds 99 in each group and leaves the 100th with one eye so he could lead the others home. With this Basil II gains the nickname Boulgaroktonos (the Bulgar-slayer). In 1205, as a counter-derivative, Tsar Kaloyan adopts the sobriquet Rōmaioktonos (Romanslayer). the rebellion of the brothers Asen and Peter in 1185. 1185 Asen and Peter reestablish Bulgaria. Second Bulgarian Empire begins. * Empire is used here as a translation of the Bulgarian "Tsarstvo," which is sometimes mistranslated as "kingdom." The title Tsar is equivalent to Emperor, not King.